I truly have the most wonderful church family. Last Saturday they threw Annabelle and me a sweet little shower to celebrate her arrival and all things pink to come at our house. Everything was so thoughtful and sweet! They used the colors pink and grey, which are the colors of her room. I don't know if I have yet mentioned on here that her room matches my blog. Not on purpose. I'm sad that I didn't get a pic with the eight hostesses before I left, but here are some of the pics my sweet friend Amy (who opened her home for it) sent me. My friend Allison created a hot chocolate bar with homemade marshmallows and cinnamon whipped cream. 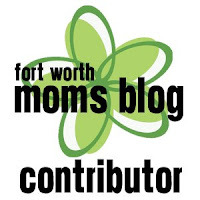 She talks about it on her blog What This Mama Eats! 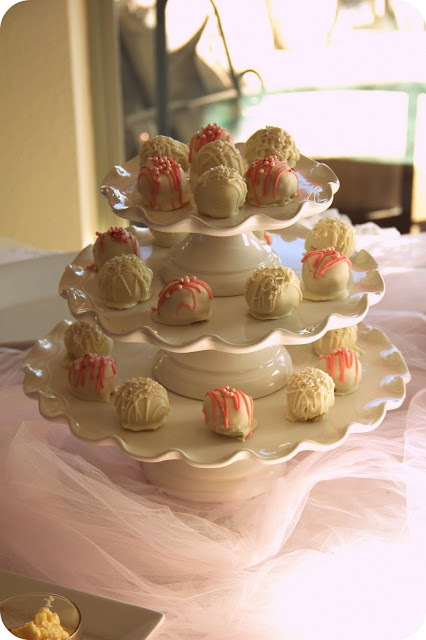 They served cake balls and delicious brunch food like quiche, sausage balls, and a fruit compote. It was all so good! Nearly every picture I'm in, I'm making a crazy face at how cute every gift is. This is one of my tamer moments. My Grannie gave us a Vera Bradley bag that I'd been wanting for my girl. It will be her bag for the hospital, but it will also be one that she carries forever! I have this same size duffle that has been travelling with me since 2001. The pattern is called Ribbons, and I can't wait to stock up on some of the matching accessories for her. Annabelle's sweet little Beaufort Bonnet from my parents. I am so excited to see her sweet face in it! I love being part of this community of believers. Some of these ladies are my age, and some of them have grown children and have already traveled this road. I'm so thankful to them for their love and encouragement during these early years of motherhood. 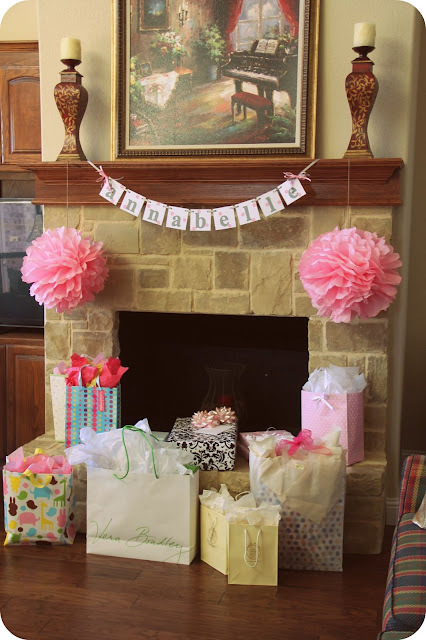 We are ready for our sweet Annabelle with all things pink! What a lovely shower! You look adorable. :) I love Vera Bradley too! Hadley as a BB to wear, too! Our kiddos NEED to meet! Same ages, same cuteness - he he! What a sweet shower! I am hoping to get a bonnet like that for our baby girl we are adopting in April. I think they are beyond precious.